You are currently browsing the tag archive for the ‘Jan Svankmajer’ tag. ‘Les frères Boutdebois’ are two wooden puppets who perform some acrobatic tricks against a theatrical backdrop. The film contains no story and ends abruptly, but the stop-motion is quite good, and an enormous improvement on ‘Japon de faintasie’. The two puppets seem to have some character, and the trick photography is pretty convincing. Somehow this short little film seems the direct ancestor of Jan Švankmajer’s stop-motion films, both in animation style and in atmosphere, even though this film lacks Švankmajer’s surrealism (or that of Cohl’s own ‘Fantasmagorie’ for that matter). ‘Flora’ is an ultra-short film made for MTV. It only lasts 30 seconds. In it we watch a woman who’s tied down to a hospital bed. She apparently consists partly of vegetables, which are quickly rotting away, as if life is leaving her by the seconds. There’s a relieving glass of water nearby, but out of her reach. This is a puzzling and rather unsettling image, which knows no release. Flora was the Roman goddess of flowers, and her features resemble that of a Giuseppe Arcimboldo-character, another homage by Švankmajer to the Renaissance-master, after ‘Dimensions of Dialogue‘ (1982). But how did the goddess come into this setting of utter distress? Watching her decaying alive is painful, even within this short time-frame. ‘Another Kind of Love’ is a beautiful result of the glory days of MTV: A video clip by Jan Švankmajer! Švankmajer treats Hugh Cornwell’s charming if rather forgettable song in his own typical way: the setting is one windowless room, he films the ex-Stranglers singer’s mouth a lot in close-up, there are objects with tongues (in this case singing shoes) and there’s a beautiful clay woman, who shares features with the woman in ‘Dimensions of Dialogue‘ (1982), apparently because the same template has been used. Highlights form the deformations of the singer’s head, whose features have been reproduced very well in the clay model, and the clip’s finale, in which the woman emerges from the wall to embrace the singer, and drawing him into the wall, leaving the room empty. Švankmajer’s films in the communist years preceding the velvet revolution of 1989 show a lighter tone than his earlier films. It’s like one can breath some of the thawing atmosphere in Czechoslovakia during the Perestroika years. ‘Virile games’ is a typical example. Although the film contains some very graphic violence, the film remains a rather cartoony atmosphere, and its end is rather tongue-in-cheek. In ‘Virile Games’ we follow a mustached man watching a football match on the television. It’s a very weird soccer match, however: all players have the spectator’s face, and scoring happens by killing the opponents. These killings occur in the most bizarre ways, all deforming the opponent’s head till the player drops dead. One opponent for example is killed with cake forms, another by toy train…. In the second half the football match moves to the spectator’s own home, and the killing continues with the man’s own kitchen tools. However, tied to his screen, the man keeps watching the television set, not noticing that the violence occurs just around him. 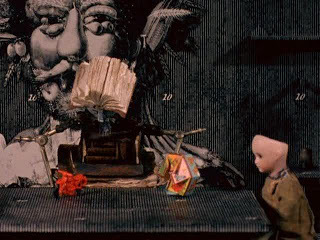 In this film Švankmajer blends live action, stop motion, rather Terry Gilliam-like cut-out animation and pixilation with the stunning self-assurance of a mature film maker. Especially the clay-animation is top-notch. Like Georges Schwizgebel’s ‘Hors-jeu‘ (1977) the film directly couples soccer to violence, a clear indication of the author’s worries about growing football hooliganism. Apart from that, the film shows the maker’s trademark ingredients, like his obsession with food. After his not all too successful adaptation of ‘The Fall of the House of Usher‘ (1980), Czech film maker Jan Švankmajer returns to Edgar Allen Poe with ‘The Pendulum, the Pit and Hope’, with much better results. In ‘The Pendulum, the Pit and Hope’ Švankmajer tries to visualize Edgar Allen Poe’s most sensory and scariest story, ‘The Pit and the Pendulum’. He succeeds masterfully, merging the viewer with the protagonist, and retaining the horror of the discoveries of the torture chamber. The story is told very straightforward, in black and white, without dialogue, voice over or music, giving it a raw and uncanny sense of realism. Švankmajer rejects Poe’s deus ex machina, however, but takes the story to a better, if more depressing conclusion. ‘The Pendulum, the Pit and Hope’ is essentially a live action movie, and contains little animation. However, in its disturbing take on Poe it is one of Švankmajer’s masterpieces, and definitely deserves to be better known. In ‘Down to the Cellar’ Jan Švankmajer explores the fears of a child. The film’s story is pretty straightforward: we watch a little girl (engagingly played by young Monika Belo-Cabanová) descending the stairs. She has to fetch some potatoes in a deep, dark cellar. However, her task will not be an easy one. Already her way down the stairs to the cellar is frightening, when she’s hindered by two adults who regard her all too knowlingly. In the cellar, the girl sees strange things happening, like old shoes fighting over her croissant, and a cat growing to gigantic proportions. Even the potatoes won’t cooperate, rolling back into the case she picked them from. Worse, the cellar appears to be inhabited by the same two adults, who perform strange rites for her very eyes. Their invitations to the girl are dubious, and luckily the girl declines. Unfortunately, at the end of the short, she has to face her fears, once again. ‘Down to the Cellar’ contains a hard to define, but strong and disturbing threat of child abuse. The short is mostly shot in live action, and contains only a little stop motion animation. However, it’s arguably Švankmajer’s most moving film. Švankmajer keeps the child’s perspective throughout the movie, and we immediately sympathize with the little girl and her plight, sharing her state of wonder, fear and despair. Švankmajer would explore the film’s theme again in his fourth feature film, ‘Otesánek’ (2000). Together with ‘Jabberwocky‘ (1971), ‘Dimensions of a Dialogue’ can be considered Švankmajer’s masterpiece. It mixes excellent design with virtuoso animation and astonishingly original story material. With ‘Dimensions of a Dialogue’ Švankmajer defined a style he would maintain into the early 1990s, resulting in most of his best films, including the feature lengths ‘Alice‘ (1987) and ‘Faust’ (1994). ‘Dimensions of a Dialogue’ contains three different ‘dialogues’, without using any real dialogue in the soundtrack. These three dialogues are pure visual encounters, making this film very universal. Like in all his films, Švankmajer’s visual language is highly surreal. Yet, the three dialogues follow their own inescapable inner logic, with disturbing results. The film does not as much feature dialogue as well as rather violent clashes. It seems to show the inability of humans to communicate. The first, ‘Factual dialogue’, is the most violent of the three episodes. It shows three heads moving in a 2-dimensional space. The three heads are clearly inspired by renaissance painter Giuseppe Arcimboldo and consist of food, household tools and office equipment, respectively. The heads devour eachother, destroying their parts more and more before spitting them out. Like ‘Et Cetera‘ (1966) there is a sense of pointlessness in this endless string of violence, which tells something about humanity. The third part, ‘An exhausting dialogue’, is the most comical one, and seems to portray a discussion going haywire. It features two realistic heads on a table, producing a toothbrush and toothpaste, bread and butter, a shoe and a shoelace and a pencil and a sharper in more and more absurd combinations to the exhaustion of both. The soundtrack is perfect throughout the picture, but exceptionally so in this third part in its combination of Jan Klusák’s music and train sounds. ‘Dimensions of a Dialogue’ is inexplicable, but communicates on a subconscious level, like all great surreal art. It perfectly shows the power of animation in showing the human condition using the very outskirts of imagination. The result is no less than one of best animation films ever. Jan Švankmajer retells this famous story by Edgar Allen Poe using a narrating voice over and black and white images of several different objects. The images, some of which are animated, are sometimes quite disturbing, and are at points even able to evoke the horror of the story. However, most of the time they seem totally unrelated to the narration, and their visual power in fact often distracts from the voice over, making the story very hard to follow, indeed. ‘The House of Usher’ is a daring experiment in cinematographic storytelling, but not really a successful one, and Švankmajer would not repeat it. Nevertheless, three years later, the Czech film maker would return to Edgar Allen Poe, in ‘The Pendulum, the Pit and Hope‘, with much better results. ‘The Cabinet of Jan Svankmajer’ is a documentary about the Czech master of surrealism. It was made by the Quay Brothers with the sole purpose of being able to watch Švankmajer’s films themselves. Advertised to the BBC as a documentary on French and Czech surrealism, the film is rather highbrow, featuring artists and art historians, whose remarks are sometimes very difficult to grasp, indeed. Unfortunately, the master himself refused to be interviewed and he is not shown at all. Luckily, Švankmajer’s strong images speak for themselves, and the documentary undoubtedly helped to raise interest in Švankmajer’s films in the West. The documentary shows excerpts from Švankmajer’s films ‘Dimensions of a Dialogue‘ (which de facto is shown in its entirety), ‘The Last Trick‘, ‘The Flat’, ‘Et Cetera‘, ‘Jabberwocky‘, ‘Historia Naturae, Suita‘, ‘The Ossuary‘, ‘Games with Stones‘, ‘Punch and Judy’, ‘Don Juan‘ and ‘The Fall of the House of Usher‘. However, ‘The Cabinet of Jan Svankmajer’ is also interesting for animation buffs, even for the one who have seen all Jan Švankmajer’s films, for its original interludes, which are animated by the Quay brothers. These interludes have a truly Švankmajer-like atmosphere, highlighted by the reuse of music from Švankmajer’s films. They feature a Švankmajer-like teacher, made of household objects, and his apprentice, a doll, whose head is emptied in order to let him experience the world anew. 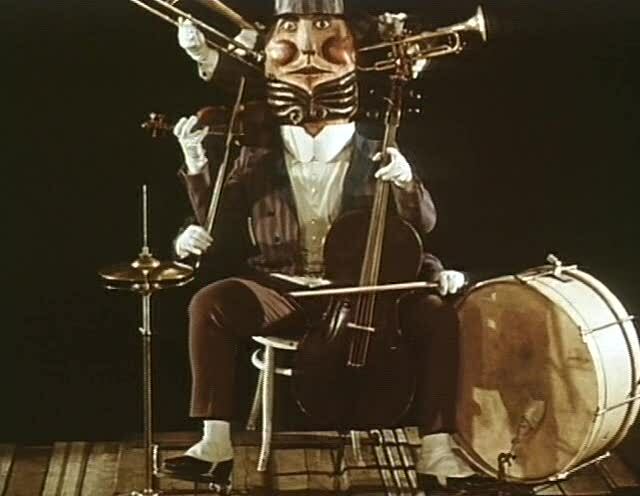 These interludes are no less than wonderful and form an animation short in itself, which is both a great homage to the Czech master and a showcase of the Quay brothers’ own art. In fact, the Quay Brothers compiled the interludes and these are available and widely known under the same name as the complete documentary, which is, in fact, eclipsed by the animated short version. 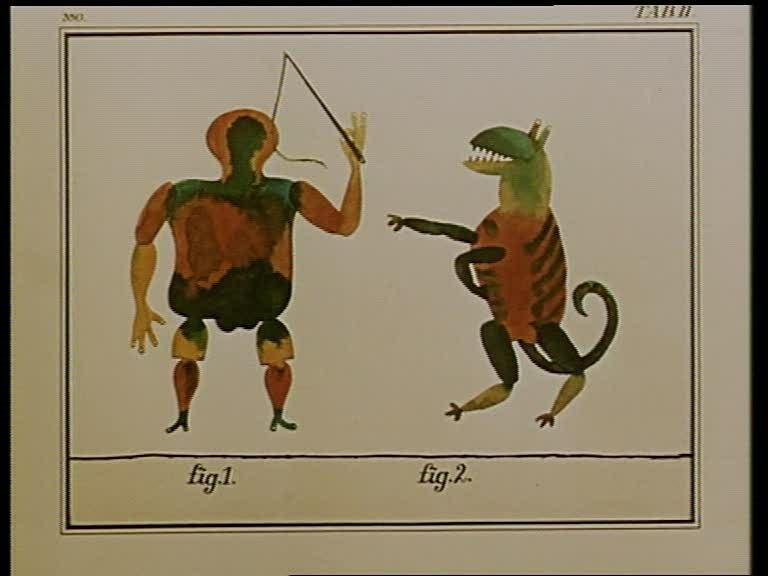 Animated sketches of drawings by Leonardo da Vinci are alternated with excerpts from stock live action films. Atypically for Jan Švankmajer, this film uses pencil animation only (except for a short stop motion segment of a pencil drawing a hand). The animation of Leonardo da Vinci’s drawings is both stunning and very convincing. Unfortunately, the nonsensical interruptions with stock film wear the film down, rendering a boring film with an unclear message. 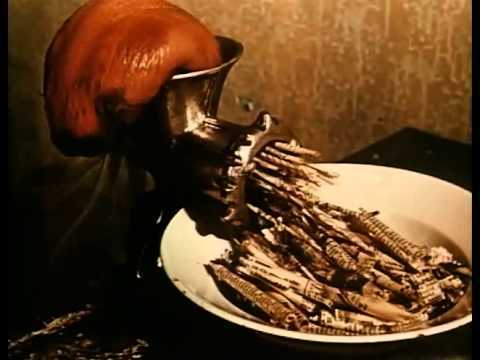 Nevertheless, the Czech communist authorities responded negatively to Švankmajer’s unauthorized post-production of this film, with the incorporation of images related to daily life – presuming a hidden political message. So after ‘Leonardo’s Diary’ Švankmajer was forced to lay down his work for seven years. Only in 1979 he would make the start of a second career, in which he would produce his best films. 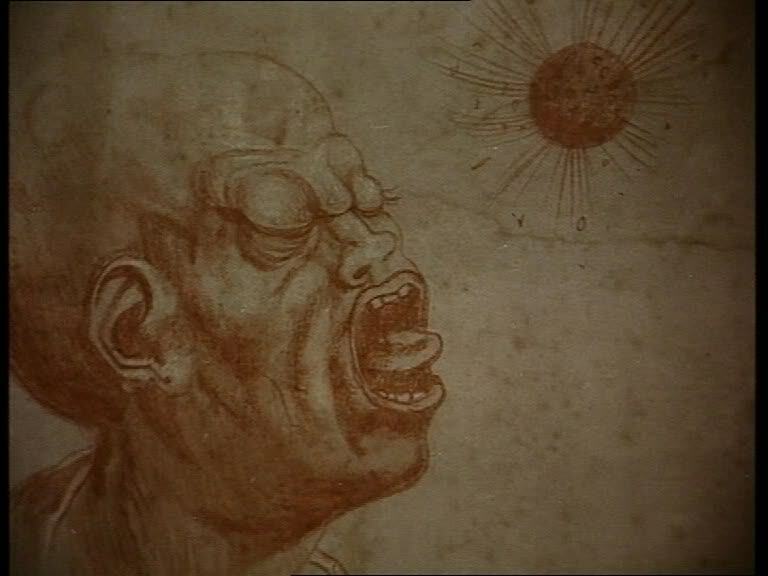 However, Švankmajer would never return to drawn animation, and ‘Leonardo’s Diary’ remains the only testimony of his skills in this form of art. 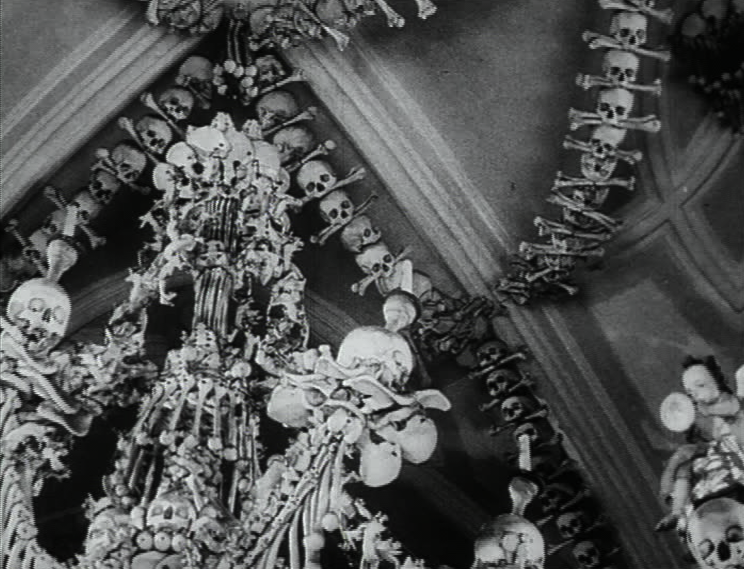 ‘The Ossuary’ is a commissioned documentary film about a Czech chapel in Sedlec, which is decorated with thousands of bones and skulls of victims of the 1318 plague and of the Hussite wars of 1421. Two versions of this film exists: one with a soundtrack of a rather mundane guide guiding a group of children, in which she repeatedly warns not to touch the bones on a penalty of fifty crowns. Her tour is mixed with the uncanny sound of a rattling bicycle. For unclear reasons this soundtrack was considered subversive and forbidden by the Czechoslowakian regime. Therefore a second version was made using a jazz soundtrack. In both versions the soundtrack conflicts with the morbid images, which are composed in a rhythmical way that even appeals when watched silently. The film contains no animation, but is full of Švankmajer’s idiosyncratic cinematography. ‘A Quiet Week in the House’ is the last film in a series of four involving people facing surreal settings, which Švankmajer made in 1968-1969.
in this film a fugitive seeks shelter in an abandoned house. Every day he digs a hole in one of the doors of the corridor in which he sleeps. Every day he looks through the hole to watch weird surrealistic images of inanimate things behaving strangely. After a week he sets up a device to blow up all doors. The live action footage is shot in black-and-white, and is accompanied by the sound of a camera. The surrealistic images, on the other hand, are shot in color and completely silent. Unfortunately, the film is too long, and it fails to be as impressive as related films like ‘The flat’ (1968) or ‘Jabberwocky‘ (1971), being neither completely disturbing nor very entertaining. ‘A Quiet Week in the House’ remains one of Švankmajer’s rare weak films. ‘Historia Naturae, Suita’ is an abstract, yet morbid and disturbing film. It uses drawings, models, skeletons, stuffed and live animals, which change into each other and which perform morbid dances. Their antics are interspersed with a close up of a man eating meat. We see molluscs (Aquatilia, foxtrot), insects (Hexapoda, bolero), fish (Pisces, blues), reptiles (Reptilia, tarantella), birds (Aves, tango), mammals (Mammalia, menuet), monkeys (Simiae, polka) and man (Homo, waltz), successively. The music is a perfect match to the surrealistic imagery, with its rather abstract, uncanny and atonal renderings of the dance forms mentioned. In ‘A Game with Stones’ (also known by its German title ‘Spiel mit Steinen’) an odd construction, consisting of a clock, a tap and a bucket, produces stones by the hour. These stones form patterns to the music of a music box until the bucket is emptied, dropping the stones on the floor. The stones’ abstract patterns are indeed game-like, but they become more and more grim, ending in a destructive game, destroying the stones, and eventually, the bucket, leaving the machine useless. The game is over. It is Švankmajer’s genius that he’s able to give this fairly abstract film a heart and an unsettling, sad ending. ‘A Game with Stones’ is Švankmajer’s first film to use stop motion animation extensively. 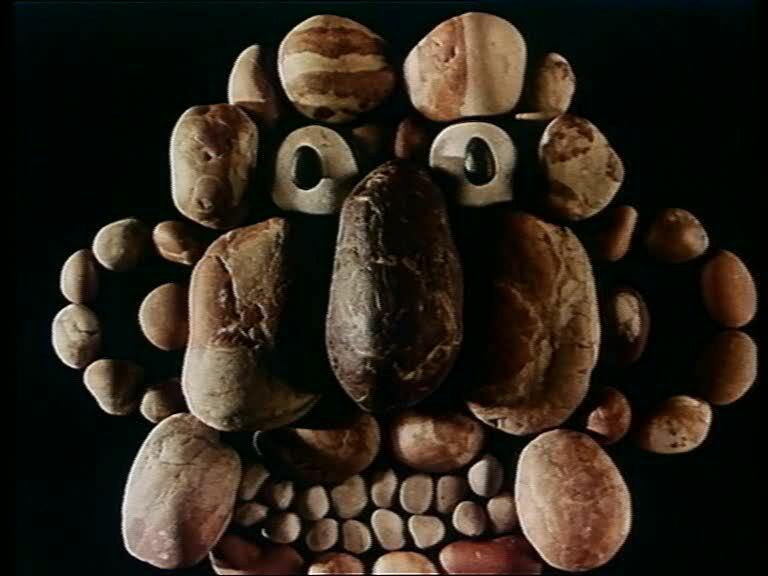 The fourth game contains faces made of numerous small pebbles, which anticipates similar heads in ‘Dimensions of Dialogue’ (1982), a film in which Švankmajer’s stop motion techniques reach a stunning apex. In ‘The Last Trick’ two magicians in large masks perform their impossible tricks one after another against a black, empty background. Although they stay polite, their congratulationary handshakes between the tricks gradually become more and more violent, ending in a disastrous mutual disembodiment. The last shot is of the only really living organism inhabiting this surrealist world, a beetle, dead. ‘The Last Trick’ is Czech film maker Jan Švankmajer’s first film, and already his obsessions with puppets, body parts and death are full blown. Its humor is dark, its images are grim and its story is very unsettling. Švankmajer’s first film (which contains a little stop motion animation) is also his first masterpiece.